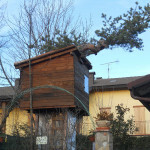 A little treehouse in the Emilian hills near Modena in Italy. I am sorry, I don’t know anything about this little treehouse, maybe it’s a treehouse for children and their parents put the plastic around the ladder so they can’t enjoy it in winter, or maybe a greenhouse for flowers and the plastic is to keep them warm, or maybe … just say what you think, let’s your imagination run! And if someone knows something about it, just send me an email to info.hometreehome@gmail.com!! !